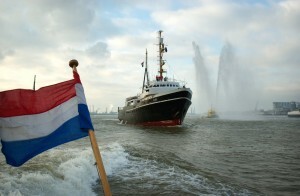 After many years of absence, the Elbe was welcomed back in Rotterdam on January 4th, 2002. For the first time since September 1976, the ship returned under the name Elbe, and with a blue painted band on the funnel. The ship’s first berth was at the Wilton harbour in Schiedam. At this place, restoration made start. The windlass was overhauled and the foremast was brought back in original condition, also without crow’s nest, among others. The widened bridge deck, with a covered sloop deck, was modified and with the removal of the helicopter deck, the Elbe regained the first lines of a sea going tug. During spring 2003, the Elbe is start ship for the Heineken Race of the Classics, that year she also participated in the Furieade. In 2004 there was an open house at Alphatron, which was also the reunion of radio operators of Radio Holland, with the commissioning of the, also, restored, radio station. 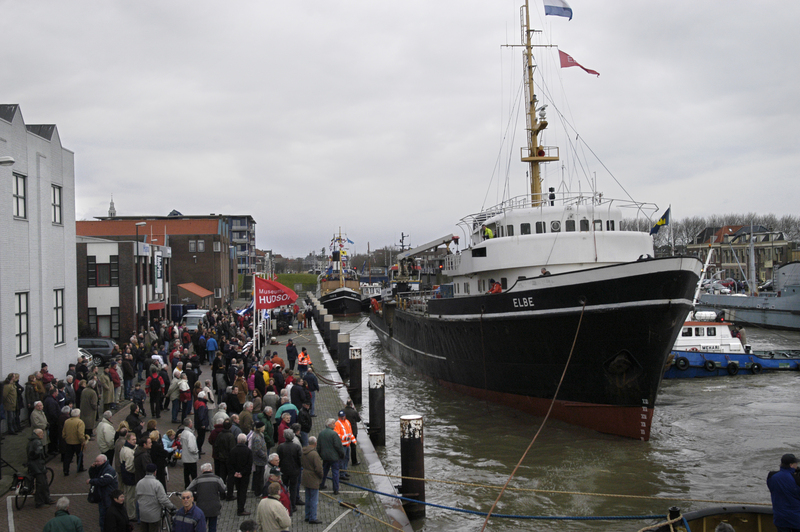 Later that year she also attended the boat parade at the 25 year anniversary of the National Towage Museum Maassluis. 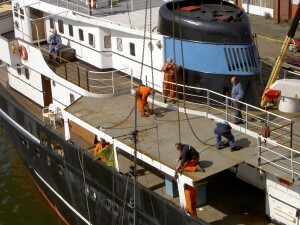 In October 2003 and April 2004, the Elbe returns to her original home port Maassluis. Until July 30, 2004, when doom strikes: heavy transport ship Fairpartner runs into the Elbe, with her bulbous bow right into her engine room. The Elbe sinks within minutes. The ship is being salvaged en repaired in Vlaardingen. The Elbe is the last ship that docks at shipyard HVO. After that, the shipyard will close. 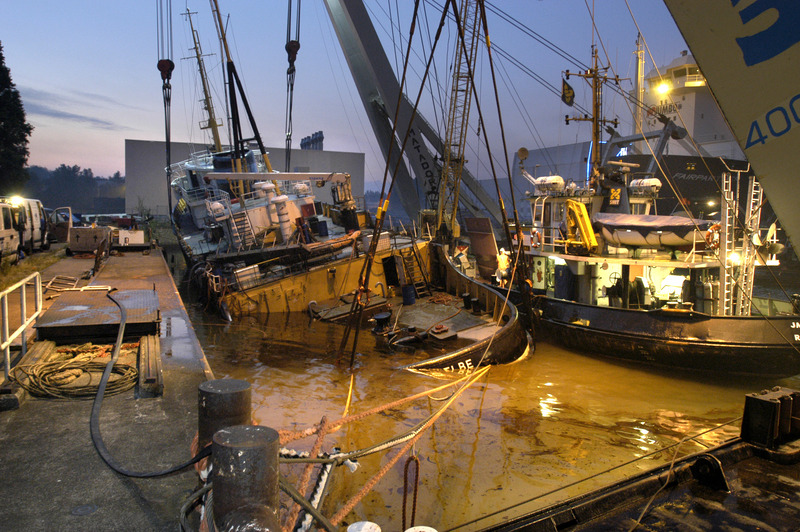 On October 27, 2004, the Elbe at that moment, is moored at Wärtsilä in the Wilhelmina harbour in Schiedam, the Elbe sinks again. This time it is an act of sabotage. Many volunteers see all the hard work they put in for many months literally disappear under water, but they hold on to their dream. The Elbe is being saved from demolition and restoration continues! On Saturday February 12, 2005, the Elbe returns to her original home port, Maassluis. With 3 degrees celsius and windforce 8 to 9 south west, the ship gets a warm welcome of hundreds of interested persons. The continuation of the restoration is larger than ever. The engine room is being overhauled completely, all cabling in the ship is being replaced, the interior is being disassembled mostly. The ship is being re-isolated completely, tank tops replaced, the in 1976 removed [berghout] is being restored completely. 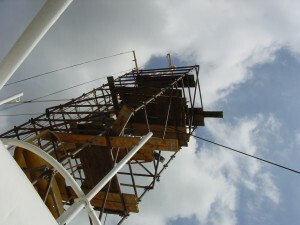 Also, the rear mast is being overhauled and placed back. The bulwark on the poop deck is being replaced and the bridge wing at the rear mast is placed back. The hood of the engine room is being renewed and the [beting] is being placed back on the poop deck. All this work make the Elbe a real sailing ship that, in 2013, fully regained her shine as sea going tug. Autumn 2013, the Elbe receives her certificates, proving she is a real sailing ship.